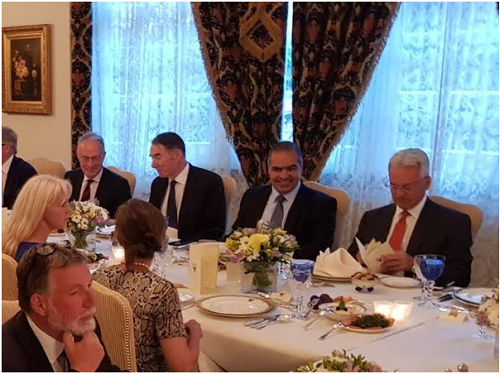 The Ambassador of the Kingdom of Bahrain to the United Kingdom, Fawaz bin Mohammed Al Khalifa, held a dinner banquet in honor of the Advisor of His Majesty King Hamad bin Isa Al Khalifa, to celebrate the knighthood that has been awarded to him by Her Majesty Queen Elizabeth II last month. Sir Geoffrey Tantum has been honored for his outstanding service and contributions in the development of relations between the Kingdom of Bahrain and the United Kingdom for over twenty years, during which he promoted common interests and cooperation between the two kingdoms. The Ambassador delivered a speech in which he expressed his appreciation for the role played by Sir Geoffrey to promote bilateral relations and for his recognition of the value and importance of these relations in maintaining the security and stability of the Gulf and the Middle East region. The Ambassador also highlighted the importance of strengthening relations between the two kingdoms in light of the current regional challenges in which certain bodies aim at undermining common interests. For his part, Sir Geoffrey expressed his pride in the strong relations linking the two kingdoms and people together, noting that the Kingdom of Bahrain has the closest relation with the United Kingdom in the region. He added that recent exchange of visits between the two kingdoms, last of which was the visit of His Royal Highness the Crown Prince, reflect the deep Bahraini-UK ties. The ceremony was attended by the British Minister of State for Europe and the Americas, Sir Alan Duncan, the former Chief of Defence Staff and British Armed Forces, Lord Richards, Lord Astor of Hever, the Director of the Conservatives Middle East Council, Charlotte Leslie, a number of diplomats and relatives of Sir Geoffrey Tantum.